Start your Easter morning by attending the Easter Sunrise Service at Ober Gatlinburg! The service begins at 6:30 a.m. in Ober Gatlinburg’s mountain parking lot, which overlooks the mountains and faces the sunrise. Attendees may either drive to the service or ride the Ober Gatlinburg Aerial Tramway to and from the service free of charge. The trams will depart from downtown Gatlinburg every 15 minutes starting at 5:00 a.m. and run until the service starts. After the sunrise service, check out the delicious Easter Breakfast Buffet at the Seasons of Ober Restaurant that is served from 7:30 a.m. to 10:30 a.m.! Another fun Easter event in Gatlinburg is the Great Smoky Arts & Crafts Community’s Easter Craft Show. This is a unique opportunity to visit with members of the local Arts and Crafts Community as they showcase their one-of-a-kind works of art and other items for purchase. The event is held in the Gatlinburg Convention Center from Thursday, March 29 to Saturday, March 31 and is open 10 a.m. to 5 p.m. each day. The event is free to attend, so bring the whole family out to this popular annual craft show. You might just find the perfect souvenir to bring home from your Easter vacation in the Smokies! While spending Easter in Gatlinburg TN, be sure to go for a hike to see the spring wildflowers in the Great Smoky Mountains National Park! The Easter weekend is close to peak season for the region’s spring wildflowers, when you can see more than 10 different species of flowers known as spring ephemerals. There are several recommended wildflower hikes at Great Smoky Mountains National Park, including the Porters Creek Trail just several miles east of Gatlinburg in the Greenbrier section of the park. You can actually celebrate Easter in Gatlinburg without leaving your cabin from Large Cabin Rentals! 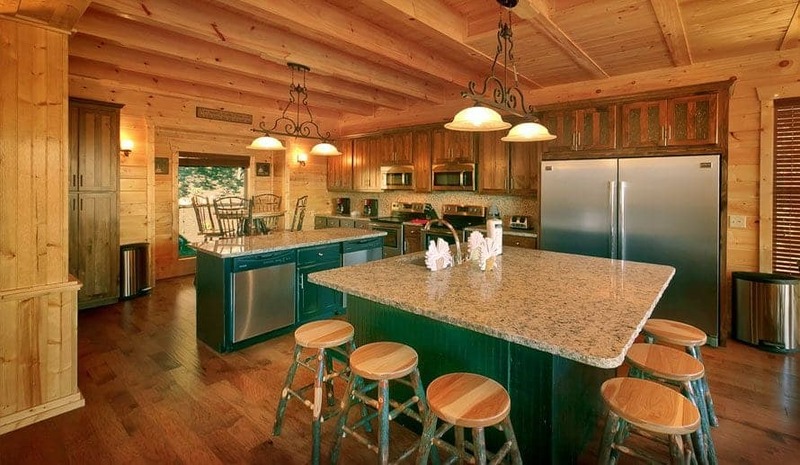 All of our cabins feature a fully equipped kitchen where you can prepare a delicious Easter meal with all of the convenient amenities of your home kitchen! After gathering all of your family and friends for dinner, enjoy a variety of entertainment options in your cabin such as game rooms and home theater rooms. Some of our cabins even feature your own private swimming pool or miniature golf course! Check out all of our large cabins in the Smoky Mountains today to plan your Easter in Gatlinburg TN! We look forward to seeing you soon at Large Cabin Rentals!